Jersey Shore Events, Coupons, Reviews! $10 off per ride with Kidmoto. Use Promo Code USFAMILYGUIDE at checkout. Kidmoto: NYC Airport Car Service With Car Seats, or Even More Than One! If you’ve ever traveled to an NYC-area airport in a car service with a baby or toddler in tow, you’re likely familiar with your options. Either you lug your own car or booster seat along and install it on the fly, you take your chances and hold your little one on your lap for the ride, or you try out a service that offers car seats. The problem with the last option is that many of the companies offering car and booster seats often arrive with improperly installed seats, a driver who doesn't know how to install them, or an old or out-of-date model. Or, sometimes, no car seat at all. The last time I tried using our local car service, the driver shrugged his shoulders and popped the trunk revealing an ancient car seat that was clearly the wrong size for my 3 year old. And, if you need more than one car seat? Fuggedaboutit. Enter Kidmoto: a new service in NYC that is striving to solve this dilemma. Catering to those traveling with small children, the Kidmoto app connects parents to a network of professionally trained drivers who provide secured child car seats for safe airport and cruise ship transportation. Read on for the lowdown on everything you’ll need to know to make your next airport trip a car seat success story. How do I request a car seat with Kidmoto? You’ll need to download the app, which is easiest to use on-the-go with your iPhone or Andorid. No mobile device handy? Use the web form here instead. Where can I request a car seat ride? Right now, the service is available for rides from locations throughout New York City to and from all area airports and cruise ship drop off locations. Kidmoto does not yet accommodate short, local, intra-city trips. How much does it cost to get a car seat? Prices vary depending on vehicle type, number of car seats and trip distance. You'll get a quote on the app or web form before confirming your trip. How many people and car seats can it accommodate? You can request a sedan with up to 1 car seat, or an SUV or minivan with up to 4 car seats. What kind of car seats are available? Who actually installs the car seat? Your driver is responsible for safely installing and uninstalling the car seat, so you don't have to stress. In fact, you can really rest easy knowing that all drivers have been tested by certified car seat technicians to ensure they know how to properly install and maintain their seats. Of course, it's always a good idea to double-check that the seat is secure. Who straps the child into the seat? 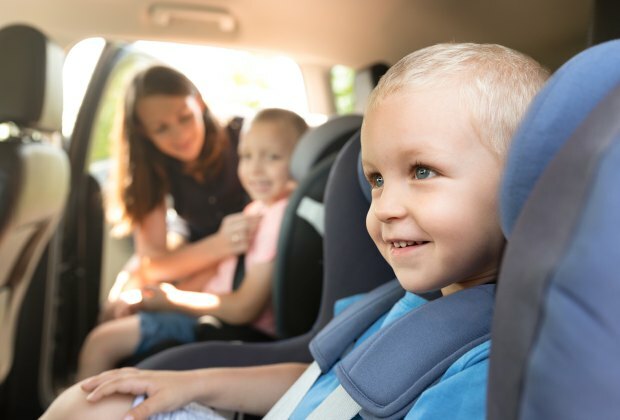 While your driver takes care of the installation, you'll be the one to safely secure your child in the seat and remove them when you reach your destination. Are there any other services available? Yes! Kidmoto also offers Kidrent, which is an add-on service providing parents the convenience of renting a City Mini stroller and/or a BabySeater pack ‘n play while staying in NYC. There is an extra cost of $15 per day per item; you can add the items on when you’re booking the car. Just remember, the rental fees are not included in the total quoted fare. So get planning for your next family vacation (preferably somewhere warmer than NYC! ), download the app, and get everyone in your family to their destination safely.